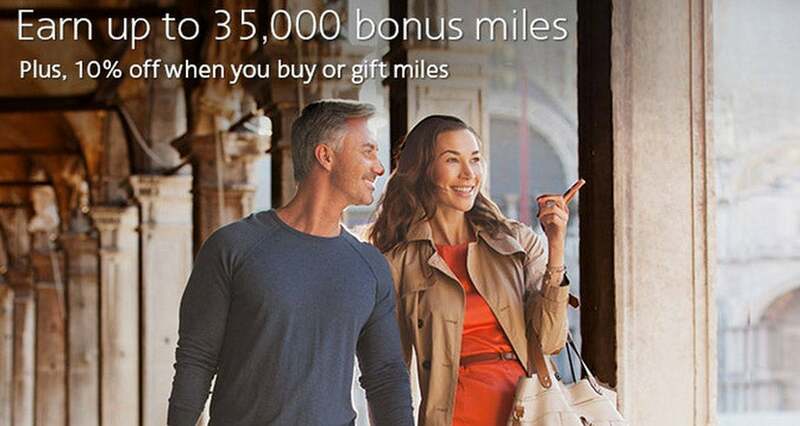 American Airlines is offering another opportunity to purchase miles with a bonus this fall — this time, you can get both a bonus and a discount when you buy miles from now through November 13, 2015. The bonus is offered in tiers, with the largest bonus available only if you buy 100,000 miles or more. The 10% discount will apply to all purchases of 20,000 miles or more, however. AA offered a similar promotion this summer with tiered discounts, rather than a bonus promotion. To participate in the promotion, you’ll have to buy at least 20,000 miles before the bonus, which will cost $600.83 after taxes and fees. If you’re interested in earning the full bonus of 35,000 miles, you’ll have to purchase 100,000 miles for $2,884.13 with taxes and fees, which works out to roughly 2.14 cents per mile, but there’s a slightly more appealing tier (which I’ll go over below). American allows AAdvantage members to purchase up to 125,000 miles per calendar year, although bonus miles do not count towards this limit. Moreover, your AAdvantage account must be more than 30 days old to buy or gift miles. This promotion is available until November 13. TPG currently values Advantage miles at 1.7 cents per mile. If you’re earning from the top tier, you’ll pay about 2.14 cents per mile in value, which generally isn’t a fantastic deal. Alternatively, if you’re on the lower end of the spectrum, you’ll pay even more, at 2.22 cents per mile. However, you’ll get the best deal by purchasing 80,000 miles — you’ll end up with 110,000 miles for $2,313, which works out to 2.1 cents per mile. With that said, if you go for the top tier, you’ll have enough miles to book a round-trip award flight in first class to almost anywhere, including a first-class experience on Cathay Pacific to Hong Kong. Usually that ticket would cost more than $25,000 round-trip if you’re paying cash, but with these miles, you could secure that for under $3,000 — if you can find availability.